Recently The REGI Education Team had the opportunity to travel to Copper Harbor, located at the tip of Michigan's Keweenaw Peninsula, to present two raptor programs in connection with the Keweenaw Migratory Bird Festival. My wife Evie and I arrived at the Brockway Inn in Copper Harbor on Thursday evening, May 8, where we were greeted by Karen Karl, who owns the motel and is one of the festival organizers. We got settled in and checked on our REGI education birds along for the trip: a Red-tailed Hawk, Great-horned Owl, Barred Owl, Eastern Screech Owl, and Peregrine Falcon. Later, we stopped at the Visitor Center to check on the set-up for our Saturday festival presentation, and we met Hannah Rooks, another festival organizer, who was very friendly and helpful (as were all the people we met there) during our whole Copper Harbor stay. We headed back to the motel and we and the birds got some rest in preparation for upcoming programs, as the cool winds whipped up waves on nearby Lake Superior. 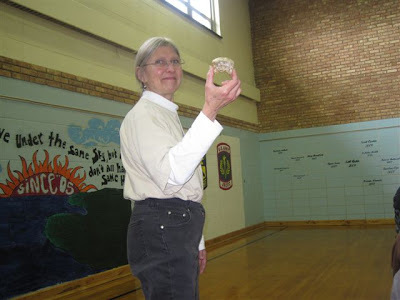 Friday morning, May 9, we packed the REGI van and drove a short way back down the peninsula to Horizons Alternative High School in Mohawk, Michigan, where we met science teacher Meg North before I presented the first of our programs to an attentive group of about fifty students. They asked many good questions and were able to see our education birds up close, and we enjoyed interacting with this great group. 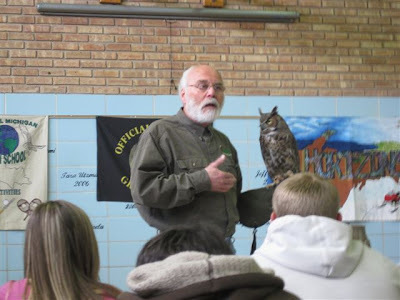 Also present for the program was Buck Lavasseur, host of Upper Michigan's long-running outdoor television program "Discovering." Buck filmed portions of our program, and I did an interview following the presentation, which he included in his May 10 broadcast. Later Evie and I further explored the Keweenaw region, including a stop up at Brockway Mountain, located above Copper Harbor, where the Migratory Bird Survey has been taking place. In the spring, when the winds blow from the south, many raptors head up the peninsula, often passing by the overlook at close to eye level. 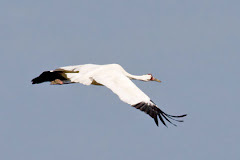 Friday evening we attended a presentation by Vic Berardi, a board member of the Hawk Migration Association of North America (HMANA), who talked about and showed some wonderful photographs of migrating raptors, focusing on the peninsula. 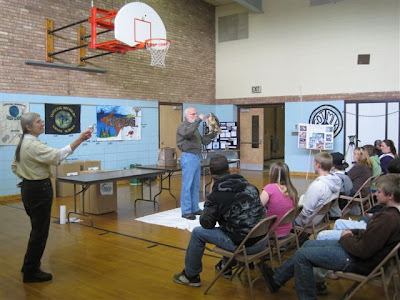 On Saturday, May 10, with the brisk winds still whipping the waves along Lake Superior, we spent some more time exploring the beautiful Copper Harbor area; then it was time for our bird festival program, located in the town hall, connected to the visitor center. The program was well-attended, with a wonderful group who also asked many great questions and had lots of close-up looks at our raptors. 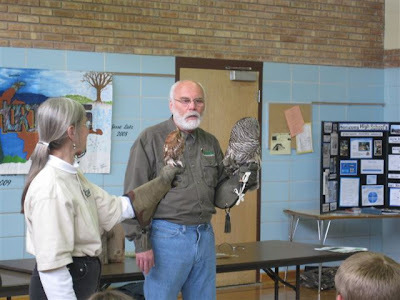 The birds were comfortable and at their best, acting as both our educational partners and as effective ambassadors for their species and the issues surrounding them. We packed up and headed back to REGI later Saturday, driving through the remnants of the May snowstorm that had hit parts of Michigan and northern Wisconsin. We realized that we ironically missed the storm by being too far north! We had great time up at the tip of Keweenaw Peninsula, and we thank everyone who made our stay there memorable and enjoyable.